Today we are reviewing the Gadget:Fit Power Vibration Plate (VIEW PRICE HERE!). This is a budget machine that nevertheless offers a range of settings and features. 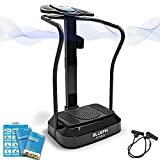 If used correctly this machine will not only help you lose weight and gain muscle but it will also help alleviate stress and improve your balance and circulation. Read on to find out more. 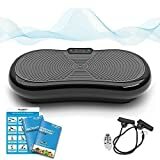 The Gadget: Fit offers 50 speed options, which may not be as many as some other more high-end vibration plates but considering the cheap price it is still very reasonable and will allow you to improve over time. 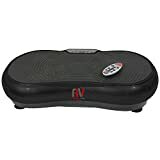 This vibration plate machine has three in-built work out programs that you can use to help get you started and keep you on track. Working out on your own can be difficult especially if you aren’t following an exercise video and you don’t have a set routine, so these workout programs are a really good way of showing you how to make the most out of your machine. These workout programs will focuses on different area and one will help you lose weight whereas another may help you gain muscle, so you will also be able to select the program that best matches your exercise goals. The Gadget:fit comes with a display monitor that shows you the time, pulse and speed that you are working with. This monitor also lets you easily control the machine and has options to turn it off and increase the speed by a simple touch of a button. 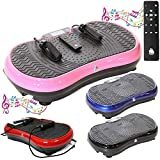 Not only does this vibration plates machine come with handles to help you keep your balance, but it also comes with hand straps that you can clip to the sides of the machine and give you arms as well as your legs a good workout. The Gadget:fit is equip with a 600W motor which will efficiently do the job without making much noise. The weight limit for this machine is 120kg, so anyone who weighs less than 120kg will be able to use these vibration plates. This machine uses anti static and anti jamming mechanisms to help it run efficiently. This machines dimensions are 80 x 72 x 120 cm, so keep this in mind and make sure you have enough space before purchasing. If you are looking for a high-end machine that is packed full of unnecessary features and extra perks then you may want to look elsewhere, but keep in mind that many people never even use all of the features that more expensive machines offer because they simple never need to. This is an affordable machine that still has the most important features I.e speed settings, work out programs, a sizeable motor and a user-friendly display and so if you are on a budget and you are looking for an efficient machine the Gadget:fit may be for you. 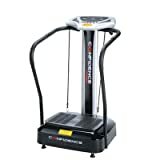 Now that you’ve decided to buy a vibration plate machine you may think the hard parts over, but as there are so many different brands and models available on the market it can be quite hard to find the machine for you. When buying any kind of personal gym equipment there are a few things you’ll need to consider. The motor is an important component of the vibration plates machine because the quality of the motor will effect the quality of your workout. More powerful motors will be able to handle heavier weights and will be able to run faster and more efficiently, whereas less powerful and smaller motors will have offer less variety and may not run as effectively. Bigger motors will also tend to be quieter than smaller motors because the larger the motor is the less hard it will have to work to deliver the same results. Therefore if noise is an important factor for you (perhaps you live in a small apartment, you live with house mates or you just want to be able to watch TV while exercising) it’s important to consider that smaller motors are likely to be noisier than larger motors. When you first start using your vibration plates machine you may want to start off on a low speed setting so that you can get used to it, but as you start to improve it’s important that you are able to increase the speed at will. This is because our bodies need to be challenged in order to keep improving; if your body becomes comfortable with your workout it won’t need to push itself as hard and therefore you won’t burn as many calories or gain as much muscle as you would if you kept increasing the speed and pushing yourself to improve. Personal exercise equipment is a big investment because they tend to be bulky and expensive items, so it’s important that you’ll be able to use your machine over time. Make sure that your machine has enough speed settings to keep you improving in the months and years to come. 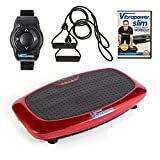 When shopping for vibration plates you may be tempted to go for the cheapest thing you see, but this isn’t always in your best interest because it will work out cheaper to buy something that is durable and long lasting rather than buying something that keeps breaking every few months. On the other hand, it is also important that you don’t spend too much on a product when you could’ve found a cheaper alternative elsewhere. That is why reviews like this, as well as customer reviews on Amazon, are really important to give you an idea of how good a product actually is. It may sound obvious, but before you buy an exercise machine you need to make sure it will actually fit in your house! Most vibration plates will state their dimensions on the specification part of their listing, so take a look at these before making your choice.